Originally from Asia, the Bloomsdale variety was introduced to the American gardener in the early 1900's and has remained the most popular spinach ever since. Tender dark green crinkled leaves with rich flavor produce over a long period. This spinach produces dark-green, deeply savoyed (crumpled) leaves which are tender and delicious. It resists bolting (forming seed stalks) longer than most spinach. Used fresh in salads as well as cooked. Plant seed outdoors as soon as the ground can be worked. Plant in rows 24 inches apart spacing seeds 1 inch apart in the row. Cover seed with 1/4 inch of fine soil, well pressed down. Keep moist until seeds sprout. When plants are 3-4 inches tall thin spacing plants 6-8 inches apart. Spinach can be planted until September. 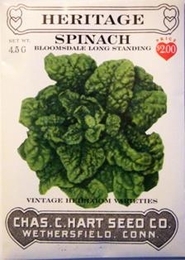 Bulk Heirloom Spinach seed available.